The Blues in 12 Keys Walking Bass tab edition – The information builds in a stepwise progression enabling the beginning to advanced bassist to gather the necessary tools required to find their own voice as a bassist. The Blues in 12 Keys Bass tab edition . 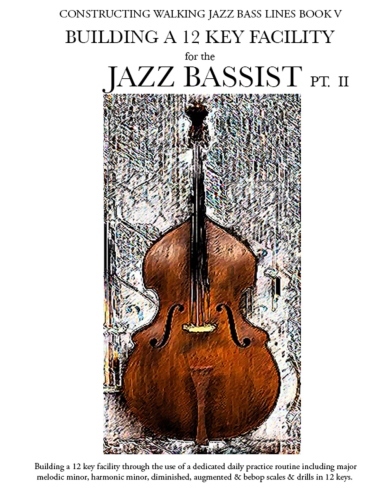 Book I in the Constructing Walking Jazz Bass Lines series is designed to give the aspiring bassist of all levels the tools and devices required to construct professional level jazz bass lines. Most importantly to build a strong functional awareness of how to function as a professional bassist in any musical setting. The information builds in a stepwise progression enabling the beginning to advanced bassist to gather the necessary tools required to find their own voice as a bassist. The Blues in 12 keys has many advanced concepts and techniques built into the lesson material, enabling the bassist to develop their own language and take their playing to the next level. Part 2 of the book includes the Blues in 12 keys with over 150 choruses of professional level Jazz Blues bass lines outlining various chord substitutions, turnarounds and rhythmic devices. It is essential that Jazz musicians of all levels practice in all keys. The Blues in 12 Keys is an excellent source to develop musicianship, build a jazz bass line vocabulary, develop right and left hand technique. As well as a building a 12 key facility and developing the ear. The Blues in 12 Keys Bass Tab Edition is an excellent source of learning to read music. The book has the standard bass clef notation directly above the bass tab and enables the electric bassist to apply what they already know to the task of learning to read music. The material presented in this book is exactly the same as the e standard notation volume. Giving the bassist reading Bass Tab access to information used by professional level Jazz Upright Bass players. Enjoy the journey.